Capacity: How much liquid can your new tumbler hold? Whether you need a lot or just a little, we’ll let you know the capacity of each in ounces. BPA Free: BPA is a chemical found in some plastics that can leak into food. We’ll let you know if the plastic pieces of each tumbler contain any BPA. Lid: Want a lid with your tumbler? If you need one, check this stat here; we’ll give you a better idea of what the lids look like in the descriptions. Insulated: Need to keep your hot liquids hot or your cold liquids cold? Each tumbler description will have an indication if it is insulated or not. Stainless Steel: What is the inside of the tumbler made from? We’ll indicate here if it is stainless steel and we’ll also give you more information in the description. 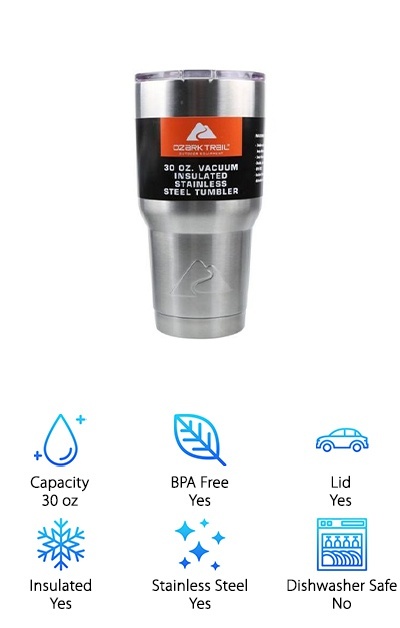 Dishwasher Safe: Can this tumbler be put in the dishwasher? While most tumblers are hand wash only, we’ll indicate here if it’s okay to machine wash.
Now that those stats are out of the way, let’s move onto the reviews! Each of these tumblers is awesome, and we love each one equally except for the first and second on the list. The first will be our Top Pick, which was our overall favorite tumbler. The second is our Budget Pick, a sweet tumbler with great features for a great price. If you are in a hurry, be sure to check those two out first. Now, let’s get to those reviews! It should come as no surprise that YETI made this list! 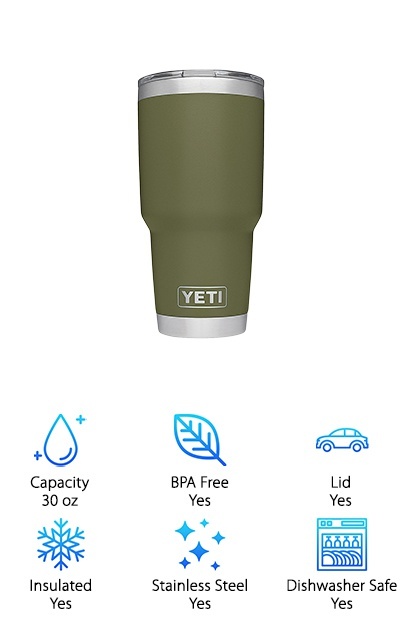 The YETI Rambler is the best-insulated tumbler we’ve ever seen, and we don’t know anyone who doesn’t love theirs! These amazing 30-ounce tumblers are designed with insulation in mind; these cups will keep hot things hot and cold things cold for a very long time! They feature a double-wall vacuum in between the interior and exterior of the cup; the lack of air in the middle of the cup ensures that heat can’t get in or out! The YETI cup is also durable; it’s stainless steel and designed to never fade or peel. The steel is kitchen-grade 18/8 which is puncture-resistant and rust-resistant. We love the grippy exterior that helps you to keep your hold while still looking absolutely fabulous! Our Budget Pick is not only a great deal on an awesome tumbler, but it’s also the best-insulated tumbler with straw around! 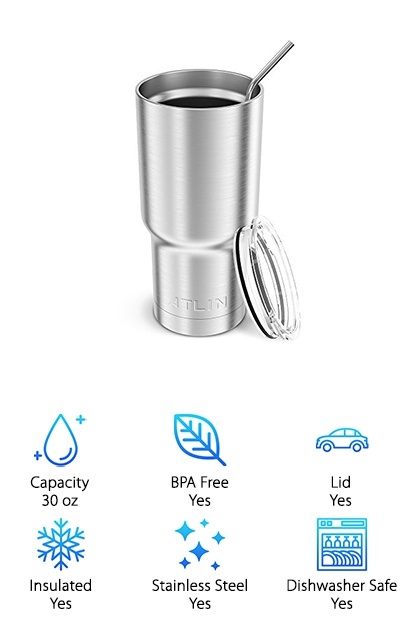 The Atlin Stainless Steel Tumbler is one of the few tumblers we’ve seen that actually comes with a straw; this is great if you like to drink your hot or cold drinks that way. 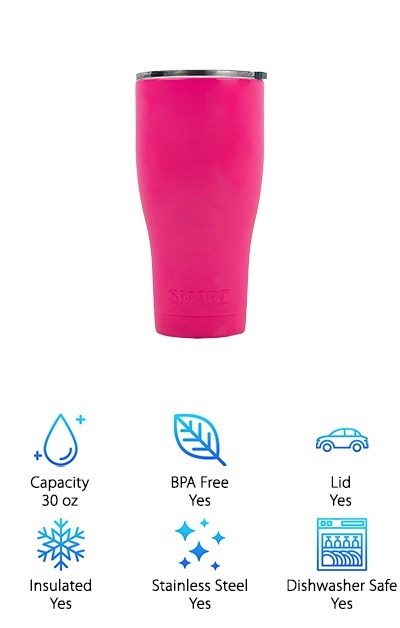 The cup is 100% stainless steel, BPA-free, and is safe to put into the dishwasher. It holds up to 30 ounces of liquid, but that doesn’t stop it from fitting into most cup holders in vehicles! The double-layered insulation keeps the temperature pretty steady inside of the tumbler, making it perfect for either hot or cold drinks. And our favorite part? 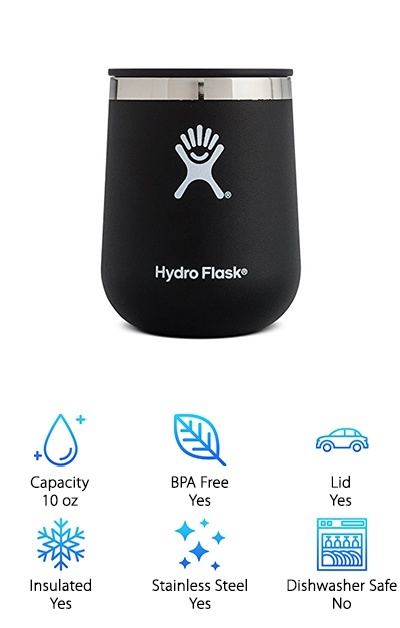 The lid is clear, making it easy to check the level of your drink inside without having to open it up and lose precious heat or cold from inside. Want to see another of the best stainless steel tumblers we’ve ever seen? The Greens Steel BEAST Tumbler is an amazing tumbler that comes in both 20- and 30-ounce sizes. This thing is made from quality stainless steel that is both strong and insulated. It’s dishwasher safe; it’s made from premium 304 18/8 food-grade stainless steel that won’t get distorted in the heat of your dishwasher. It’s even rust-resistant! 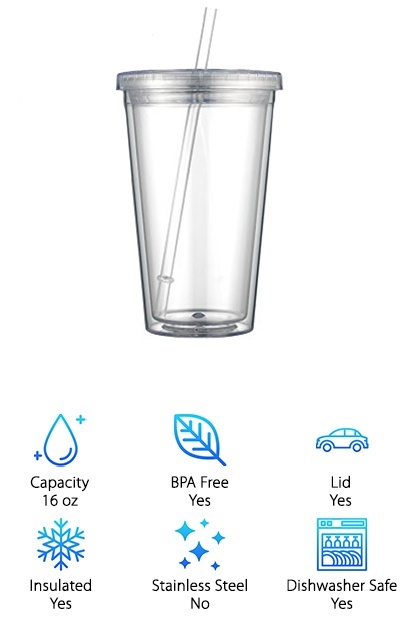 Along with your tumbler, you’ll get a splash-proof lid, two “unbreakable” straws, and a cleaning brush to help get those straws as clean as possible. These awesome tumblers are ready for your coffee, soup, icy-cold cola, or even a slushie or smoothie. It will keep it cold or hot for a very long time with it’s double-wall, vacuum insulation. And the best part? 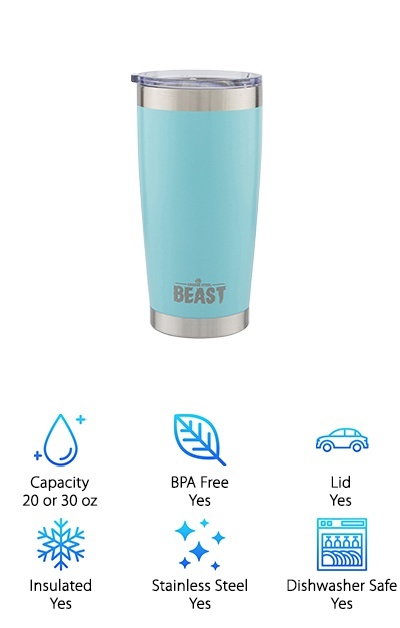 The Greens Steel BEAST Tumbler comes with a lifetime guarantee! Want a bunch of the best tumbler for cold drinks? Awesome for both cold and hot, the Maars Classic Insulated Tumblers is a clear tumbler designed to keep your drink insulated. It reduces sweating, helping you to protect your tables and other surfaces in your home and office from water damage. 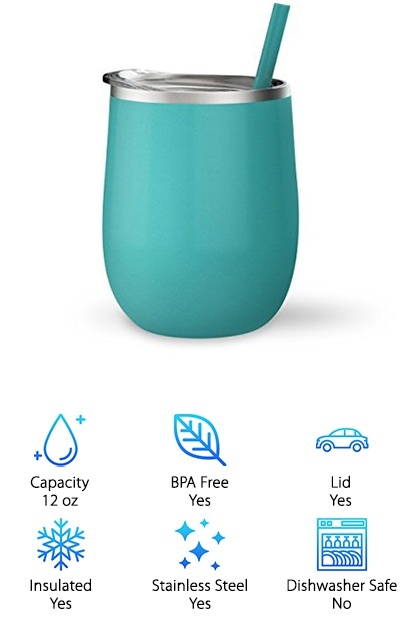 The cups are BPA-free, making them safer. They are also all dishwasher safe! They are 16 ounces, enough for most canned beverages. And you get 12 of them! That means one for everyone in the family (and probably a few extras for when the others are in the wash). The lids screw on tight to helps prevent heat transfer in or out of the cup. We really love these cups for their durability and ease of use! They are also a great price too! The amazing Ozark Double-Wall Tumblers is a 30-ounce tumbler that is super durable! Made from quality stainless steel (18/8 kitchen-grade), the Ozark is perfect for your coffee, tea, or iced drinks. It is designed to be rust-proof and BPA-free, ensuring that the mug won’t add gross flavors to your drinks. We love the design that fights condensation, saving your furniture from water ring stains. These amazing tumblers come in a two pack that’s around the same price as most single tumblers of the same caliber too! And they even come with a killer lifetime warranty! There are just so many reasons why we’re sure that the Ozark Double-Wall Tumblers is one of the best-insulated cups around. We love these tumblers, and we’re pretty sure you’ll love them just as much! Most of the best tumbler cups can keep your drinks cold or hot for hours, but not all of them can keep them at temperature for a whole day! 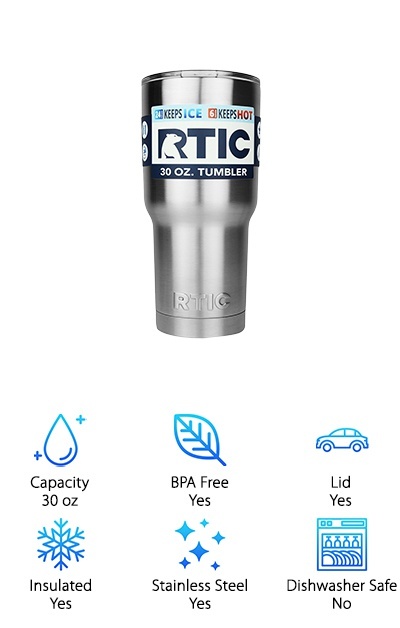 The RTIC Premium Tumbler is designed to keep stuff cold and hot for a very long time; up to 24 hours! The 18/8 stainless steel is rust-resistant and beautiful. It’s super strong; it won’t take damage from most falls. The skinny design fits most cup holders but still manages to hold up to 30 ounces of your favorite drinks. Although it’s hand wash only, this tumbler is 100% worth it in our opinion. It’s amazing construction, great price, and fantastic stainless-steel body more than makes up for it! And the crystal-clear, shatterproof top helps you to see how much liquid you have left while still protecting the temperature of your drink! Want a tumbler designed just for wine? The Hydro Flask Double Wall Tumbler is the best hot/cold tumbler we’ve ever seen designed exclusively for wine. It has a no-drip lid to keep your wine inside. It looks and feels like a stemless wine glass without the glass part! If you carrying wine about, you don’t want to have to worry about breakable glass! This tumbler is made from BPA-free plastics and stainless steel to help keep your wine safe. It has a no-slip grip on the outside to help you keep a hold of your precious reds and whites. Not to mention the insulation! This helps to keep your wine at the perfect temperature for several hours. There is so much to love about this tumbler, whether you are a wine drinker or not! We loved the wine tumbler idea so much that we decided to add a second one to the list! The SassyCups Wine Tumbler is as sassy as a wine tumbler should be! This amazing, 12-ounce cup comes with a straw and a wonderful lid. These cups come in a bunch of different colors, including teal, pink, black, orange, red, and many more. The colored outside is also scratch-resistant and grippy, helping your tumbler to look great for a long time. They can be easily personalized too if you have a screen printer who can handle them for you! We love these insulated tumblers because they keep cold drinks cold for hours and hours. Not to mention the BPA-free plastic lid that help prevent spills too! So if you are looking for a wine tumbler that doesn’t quit, check out the SassyCups Wine Tumbler! The Homitt Stainless Steel Tumbler is a great tumbler that comes in both 20 and 30 ounces. It’s made from durable stainless steel and designed for a great drinking experience. The tight-fitting lid helps to prevent spills. It comes with a great straw for easy sipping. The double-walled vacuum is super insulated to keep your drinks cold or hot for a long time. The powder-coated outside is super grippy, helping you to keep a hold of your drink. That prevents both damage and spills! It never sweats either, which also helps prevent slipping and protects surfaces. The silver-and-black exterior is also attractive, making it a great gift for the person on your list that has everything! 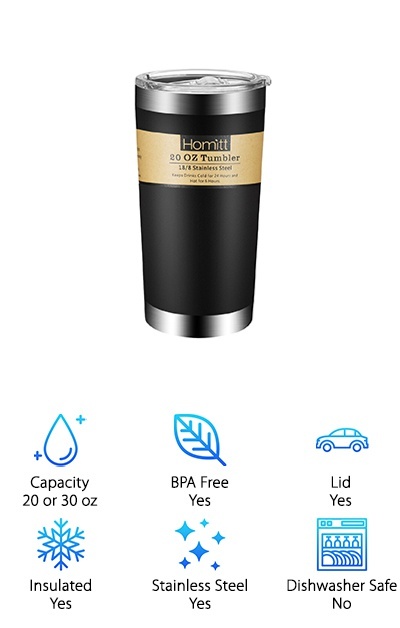 We love the Homitt Stainless Steel Tumbler, we’re are pretty certain you’ll love it too! We love all of the colors that the Smart Coolers Tumbler is available in! It comes in black, silver, pink, green, and dark blue, all of which are really attractive and very stylish. The Smart Coolers Tumbler isn’t just pretty though; these tumblers are stainless steel and insulated to keep your drinks hot or cold. The tumbler is a 30-ounce cup that fits in most cup holders. The double-walled, vacuum-sealed, BPA-free tumbler is safe, insulated, and really really works. The tumbler is also nearly unbreakable, as it is made from 18/8 stainless steel. It can hold up to 30 ounces of liquid and keep it cold or hot for hours. And it comes with a great lifetime warranty! That’s impossible to beat! There’s so much to love about the Smart Coolers Tumbler!